Life with my three year olds often revolves around negotiation. I try to convince them to eat their vegetables, pick up their toys, and behave in public. In return, they bargain with me for trips to the zoo, cookies, trains, and dinosaurs. The majority of the time, our negotiations go nowhere but every once in a while, one of us gets lucky. This time, the kids got their dinosaurs. The Natural History Museum is a Los Angeles institution. Its located in the heart of LA, next to the Coliseum, in Exposition Park (and yes, its worth the traffic to get there). The gargantuan staircase out front leads you into a world of paleontology, dioramas of African mammals, and California history. Walking through the museum’s grandiose halls swept me back in time to the days of elementary school field trips and excited exploration. The diorama halls are old fashioned but still entertaining. Its nice to be able to stand so close to wild (stuffed) animals and actually get a feel for their true size. Even with that mid twentieth century feel, we still had plenty of fun indentifying the African and North American Mammals. Of course, my kids came with expectations to see dinosaurs. Unfortunately, most of the dinosaurs are currently not on exhibit. The Dinosaur Hall is undergoing major renovations for a state of the art exhibit to open in 2011. You better believe we will be there for that! In the meantime you can still see a Trex and Triceratops battle it our in the Grand Foyer or peek inside the windows of the Dino Lab to see real paleontologists hard at work during the restoration process. The Bird Hall was another fun place to explore. There were stuffed birds everywhere! Dioramas of birds. Birds behind glass cases. Eggs from different species of birds. It was avian madness!!!!! My favorite display was the hummingbird egg next to the ostrich egg. It really put into perspective just how diverse nature can be. We quickly walked through the Gems and Minerals, Shells, and ancient Latin American Art because quite frankly, my three year olds just weren’t that interested. We spent a bit more time in the American and California History because it involved swords, cable cars, and model ships. But what really excited my kids was the Discovery Center. The Discovery Center is geared towards children and gives plenty of hands on opportunities. Ben could have spent the rest of his life building the Trex and searching for bones in the Paleontology Dig Pit. Mari enjoyed the pit as well but she also loved searching for tiny creatures inside the many terrariums they had set up inside the center. She found everything from snakes, to beetles, to giant hairy tarantulas! Eek! All in all, I think the Natural History Museum of Los Angeles County has something to offer for everyone. Are interested in spending some time exploring those great halls? Looking for details? The museum is located at 900 Exposition Blvd in Los Angeles and is open from 9:30 to 5:00 seven days a week. Adult admission is $9, Children 13-17 are $6.50, 5-12 years old are only $2 and Children under 5 are FREE. Such a bargain! The Red Rock/Borrego Canyon hike at Whiting Ranch is one of contrast. You start out in the parking lot of a Ralph’s grocery store, head through a steep, tree shaded canyon, enter a world of wildflower studded hillsides, and end in a stark sandstone canyon that looks like something you would find in a National Park in Utah. Its incredible. The hike is almost 4 miles roundtrip and mostly level. We took this hike in hopes of spotting wildflowers. They didn’t seem to be as prolific as last year but they were still plentiful. We saw plenty of purple lupines, blue dicks, poppies, buttercups, and lots of other flowers I have no business trying to identify. Its no secret that I have a serious “thing” for wildflowers and its seems to have rubbed off on my daughter as well. We can’t pass a patch without my daughter reminding me to take a picture. The Red Rock trail (and offshoot of the Borrego Canyon Trail) leads you into a land filled with cacti, circling turkey vultures, and deeply carved sandstone cliffs. Its truly hard to believe you are only a couple miles from suburbia. Its easy to find yourself staring at those red walls whilst dreaming of a world filled with condors and desert dwellers. One of the more unexpected experiences we had on the trail was having a man show us a fossil on the side of a boulder that had been washed down a creek. I knew there were fossils just waiting to be discovered but I had never actually stopped and tried to find any. They are certainly something I will start to keep my eyes open for in the future. I can’t end this post without sharing a couple of my favorite pictures from the hike. One of them is a close up of a lizard we met on the trail. He just looks so darn cute! The other is of me and my kids in a tree. Its the first shot that I have had with my kids and I actually looking at the camera and smiling in well over a year. We were out doing what we love and its a photo I will treasure forever. Many thanks to my husband, Paul, for capturing this treasured moment. Whiting Ranch Wilderness Park is located in Foothill Ranch on the corner of Portola Parkway and Market. Hour are from 7AM to Sunset. Hikers, mountain bikers, and equestrians all frequent the many trails of this beautiful park. For more information click here. For more fantastic travel photos, check out Delicious Baby’s Photo Friday here. Today I would like to welcome all the Blogtrotters out there to Double the Adventure. 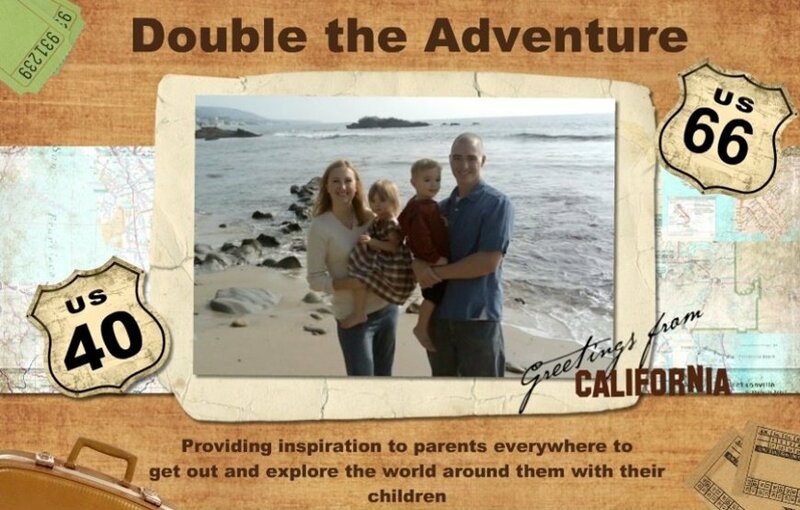 I am a mother of twin three year olds living in Orange County, CA who loves to travel, hike, and explore with my children. I hope you enjoy my introduction to the outdoor side of Orange County and stick around to join us on all of our adventures around the country and beyond. If you are one of my usual readers and not familiar with Blogtrotting, I suggest you check it out. 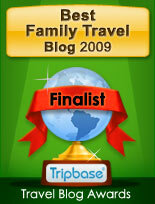 Its a great way to learn about amazing places around the world from the people who live there. When most people think about Orange County, CA, they think of Disneyland, the original “Real Housewives”, and wealth pouring out of people’s eyeballs. I am not going to lie- there is an obscene amount of wealth in Orange County and I have run into my fair share of pampered women but MY Orange County is far from anything that television has portrayed it to be. The Orange County I love has incredible weather, friendly people, and fantastic outdoor opportunities. The most obvious outdoor opportunities are at the beach. I don’t think I will ever grow tired of a day watching the waves crash as my children frolic and play at water’s edge. Our beaches vary widely from the stereotypical wide spans of sand, lively piers, and bike filled pathways of Huntington and Seal Beach to the grand cliffs and serene beauty of Crystal Cove and Laguna. Orange County beaches offer everything from world class surfing to quiet places to get up close and personal with nature at the tide pools. Some people choose to just lay back and absorb the rays while others are much more interested in being active in one of the most beautiful spots on the planet. We love to hike so following one of the ocean front trails is always high on our “to do” list. What alot of people don’t realize is that there are many more outdoor opportunities beyond the beach in Orange County. Yes, Southern California is a sea of humanity and Orange County alone has a population of three million. Luckily developers have not snatched up all the land and there are still plenty of protected spaces that are perfect for hiking, biking, and wildlife viewing. One of my favorite spots is the Laguna Coast Wilderness Park with its incredible vistas, beautiful rock formations and the only natural lakes in Orange County. We love hiking here year round because the ocean breezes keep the trails cooler than many places more inland. Another great place to explore is Whiting Ranch. You start your hike with houses on either side of you and quickly escape to true wilderness complete with deer, snakes, rabbits, and even the rarely sighted mountain lion (which I plan on never seeing!). Can you believe all of these pictures were taken on the same hike? I hope you enjoyed experiencing the gorgeous and diverse outdoorsy side of Orange County. We certainly enjoyed having you here and hope you will come back for another visit again soon! I love that end of the earth feeling. It usually involves standing at the edge of a cliff that drops off into a never ending sea full of churning blue water. I can’t help but imagine what it must have felt like to think that the earth was flat and the drop into oblivion was just on the edge of the horizon. What a scary and finite concept. Cabrillo National Monument is a great place to let your mind get swept back to the days of conquistadores, Spanish occupation, and early exploration. We decided to head over to the tide pools for the first part of our Cabrillo NM tour. I had planned our day around low tide so we would have the best opportunity to view sea life. Unfortunately, and tragically, the Chilean earthquake had hit the day before. Between the tsunami warning and the massive storm that had hit the day prior, the minus tide ceased to exist. The seas were incredibly rough and most of the tide pools were inaccessible. That being said, I felt the rough seas added to the rugged feel that Point Loma possesses. We followed the trail that hugs the cliffs and stood at cliffs edge, admiring the swirling waters below. The scenery reminded me a bit of Point Reyes in Northern California and served as a nice reminder of what the San Diego coast once was. We did manage to make it down to beach level and spot a few critters that had washed ashore. Since it was the weekend (and the first warm day in over a week), there were crowds down around the tide pools. I think if the tide was lower and people were able to spread out a bit more, it would have had a much more intimate feel. Next we headed over to the visitor’s center to get our National Park passport book stamped and learn about Juan Rodriguez Cabrillo. Cabrillo was the first European to set foot on the West Coast way back in 1542, and historians believe those first footsteps were made on Point Loma. The views from this area, including the actual Cabrillo monument are filled with vistas of the San Diego Bay and the city beyond. If you would like to visit Cabrillo National Monument (and you should) check out the park’s website here. We didn’t have time to visit the Old Point Loma Lighthouse (the park closes at 5PM due to it proximity to the naval base at Point Loma) but tours are offered frequently. It will be high on my priority list for our next visit. My kids wanted dinosaurs. It was all they could talk about since watching The Land Before Time for the first time. We saw them at the San Diego Wild Animal Park during the summer but months had past and the overwhelming call for dinosaurs (mostly in the form of ROARS!) once again filled our house. After a little bit of internet research I came across the Arizona Natural History Museum in Mesa. I will be honest. I wasn’t expecting much. But I can’t tell you how pleasantly surprised I was. The Arizona Natural History Museum provided us with over two hours of entertainment and I literally had to drag my kids out of there! The first stop on our museum tour had to be the dinosaurs. The kids went over the moon when they stepped inside Dinosaur Hall and were immediately encountered by life size skeletal replicas of the animals they had been so excited to see. Dinosaur Hall, I expected. Dinosaur Mountain, I did not. There were replicas of dinosaurs from different geological periods in different areas of the “mountain”. Many of the dinosaurs moved and made sounds. The best part was every 23 minutes a flash flood occurred on the mountain. You can see Dinosaur Mountain from many different levels inside the museum and your kids are bound to discover something new when they visit each floor. Sorry about the quality of my photos of the dinosaurs. It was very hard to watch two very excited three year olds in a museum and take pictures at the same time! The Arizona Through Time area of the museum includes gem collections, asteroids, some interesting reptiles like the snapping turtle, fossils from the days when parts of Arizona were inland seas, and a special exhibit about the evolution of the pronghorn antelope. The Southwest Gallery had some very nice exhibits about traditional southwestern cultures complete with replica villages, historical artifacts, and a place where kids can move discs to make their own examples of coil pots. Another really cool part of the museum is the jail. The museum was built on the original grounds of the Mesa Jail. The actual cells are still available and open for tour. It is amazing just how tiny and uncomfortable those cells are! This jail was so secure that no prisoners ever escaped. If the jail conditions today were as bad as they were back then, maybe people would be less willing to commit crimes! In addition to the pioneer jail, there is a replica mine that you can walk through and a place for gold panning outside. I think my kids could have done that all day long. Water, sand, and bowls to put water and sand into. What’s not to love? After a couple hours of exploring, I literally had to drag my kids out of this museum. If you are in the Phoenix/Mesa area I highly encourage you to check this museum out. The Arizona Natural History Museum is located at 53 N. Macdonald in Mesa, Arizona. It is open Tuesday through Friday from 10-5, Saturday from 11-5, Sunday from 1-5 and closed Mondays. Adults are $10, kids 3-12 are $6 and students 13 and up are $8 with ID. For more information and current exhibitions click here. Today’s guest post comes from Paul Stutzman, the author of Hiking Through. Originally when I was contacted by his publicist the goal was for him to write an article about hiking the Appalachian Trail and provide some family tips. Instead, he found Tuesday’s story on my blog and decided to write about something that is so much more important. His sentiments reflects my own desire to inspire families to get out and enjoy the world with each other. Family is such a gift and sometimes our time with them is cut tragically short. I hope you find Paul’s words just inspiring and heartfelt as I did. Initially, I came to this blog as part of a virtual book tour, hoping to promote my new book. But after browsing through this site and reading Tuesday’s story, I simply want to write a message from my heart. Cherish and enjoy your children, your spouse, your loved ones! Mary, my wife of 32 years, died of breast cancer in 2006. My life as I had known it was gone. And part of the pain I felt was in knowing that I had taken my wife and our life together for granted. My one goal in life was to be wealthy. In pursuit of that goal, I spent too much time at work and missed much of my children’s growing-up years. It was only after my wife was gone that I realized what had been mine—and I had failed to appreciate it fully. A year after Mary’s death, I quit my job and hiked the Appalachian Trail from Georgia to Maine, demanding answers from God and trying to find healing. Early in my hike, I met the man I called Sailor, who grew up on Cape Cod in the same neighborhood as the famous Kennedy family. When I first met him, I was quite impressed with his background, thinking that he was surely part of that “upper crust” society of wealth and privilege. In fact, I never knew if Sailor was a millionaire or had only a few dimes. The Trail is a great equalizer, and bank accounts don’t mean much if you’re trudging alone through the wilderness. But I believe Sailor was one of the wealthiest men I met. His wealth lay in his family. Several times during the weeks I knew him, Sailor’s sons joined him for parts of the hike. His wife also walked part of the trail with him. That man has riches far greater than any bank account. Bank accounts swell and shrivel, as we all know, but memories made with our loved ones only grow more precious with time. Whenever I had a chance on my hike, I tried to pass on this message: Enjoy and appreciate your spouse, your children, your loved ones TODAY, while you still have the opportunity. After Paul Stutzman’s wife died, Paul quit his job to hike the Appalachian trail to give himself time to think and to heal. Hiking Through: Finding Peace and Freedom on the Appalachian Trail is his story. A former restaurant manager, he is now retired and planning his next big adventure: a cross-country bicycle trip. Stutzman currently lives in Berlin, Ohio. To see pictures of his hike or to find out more about Paul and his book, visit his website at www.hikingthrough.com. I love Hawaii. There is just something about the islands that immediately puts me at peace. Perhaps it the natural beauty and balmy weather. Or maybe its the over abundance of tropical drinks. Whatever the reason, I always seem to find myself dreaming about my next Hawaiian vacation. There are two islands that are high on my list to visit: Kauai and the Big Island. Both seem to have such unique outdoor opportunities exquisite beauty. Over the weekend Jake at The Villas at Poipu Kai, a resort on the island of Kauai, contacted me to see if I wouldn’t mind spreading the word about his resorts current promotion. I know quite a few of my readers share my love affair with the islands so why not share this fun and adventurous deal! Kauai helicopter tours are a must for every visitor on the island. From the cascading waterfalls and lush tropical interiors of Kauai to the Na Pali coast, this flight lets you experience the incredible diversity of the island. A helicopter tour over Kauai reveals the incredible history, geology and beauty of the "Garden Island." You earn one free helicopter tour for each 3-bedroom or penthouse Villa booking of six nights or more. Call 1-866-407-0249 to reserve yours before March 31st. Note: While reservations must be made by March 31st, guests can travel anytime until November 15th and still get this deal. You can check out the Villas at Poipu Kai’s website here. Now I don’t know about you but a helicopter tour of Kauai is definitely something I would love to experience. I won’t be able to book a trip this month but I hope one of you will. If anyone does book this trip, let me know! And tell them Sharlene at Double the Adventure sent you!